"God's power is seen in the Pentecost story as the apostles proclaim Jesus Christ crucified and resurrected." On the Day of Pentecost the Christian Church celebrates the gift of God's Holy Spirit given to God's holy people. 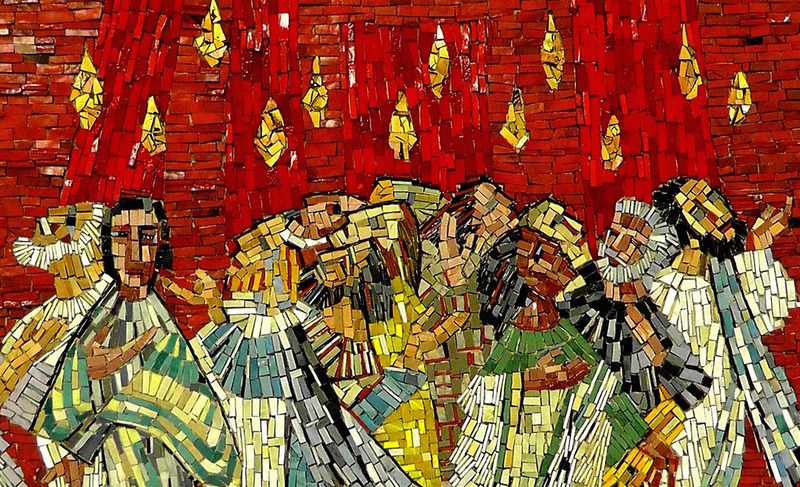 Pentecost is also the Greek name for the Jewish Feast of Weeks, celebrated 50 days after Passover. On this feast, the first fruits of the wheat harvest were presented, and the covenant made with God at Mount Sinai was remembered and renewed. In the Acts of the Apostles, Luke describes the promised outpouring of the Spirit and the beginning of the Church's mission as occurring in Jerusalem during this feast. The accounts in both Acts (Acts 2:1-4) and the Gospel of John (John 20:22) depict the coming of the Holy Spirit to the disciples assembled together. This assembly of the disciples emphasizes an important point: From the beginning, the experience of the Holy Spirit has been a corporate experience. Individuals as members of the Body of Christ participate in this experience, but the power of the Spirit is given for the life of the Church. Two key words referring to the coming of the Holy Spirit are promise and power. 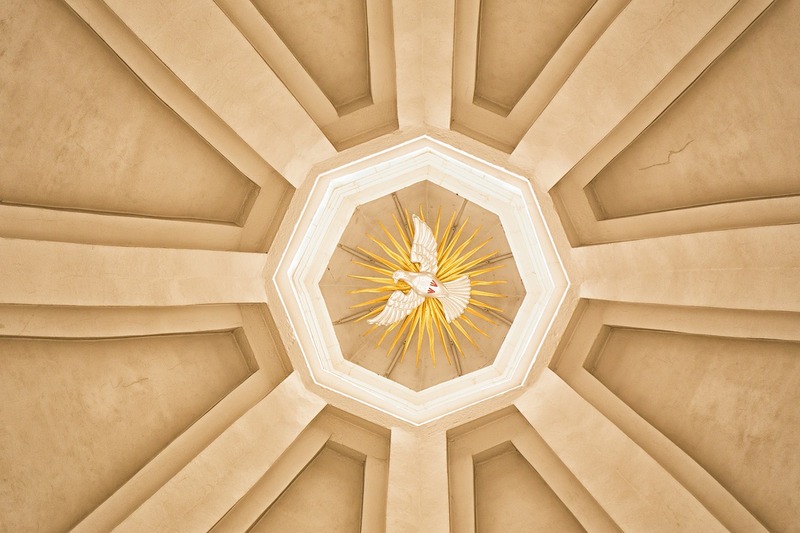 The promise of Jesus to send the Helper to the disciples was fulfilled, and the power of the Helper was bestowed, in the upper room at Pentecost. Fire and wind are signs of the Spirit's power. Fire and wind signify God's power throughout the Old Testament. God goes before the people as a pillar of fire in the exodus; God sends a wind to part the Reed Sea before them. God's power is seen in the Pentecost story as the apostles proclaim Jesus Christ crucified and resurrected. The gift of tongues in Acts 2 is a sign that God's word is no longer limited to one people or one place, one language or one race, but is now available to all people everywhere. 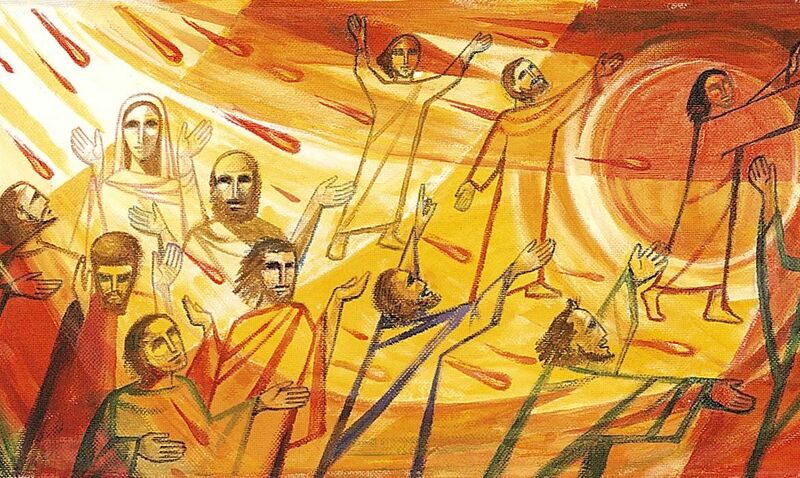 The preaching of Peter on Pentecost responds to the question raised by his helpers, "What shall we do?" The apostle replies, "Each one of you must turn away from his sins and be baptized in the name of Jesus Christ, so that your sins will be forgiven; and you will receive God's gift, the Holy Spirit." (Acts 2:38) This is still the Christian message - repentance, baptism, and the gift of the Holy Spirit. We, too, are called to preach the good news of Jesus Christ. Sing "Veni, Creator Spiritus" or "We Are One in the Spirit, We Are One in the Lord" or "In Christ There Is No East or West." Feast. If your church celebrates Easter with food - such as a buffet of Easter treats - hold the same meal on Pentecost. Invite strangers or neighbors to join the feast. Invite children, youth and adults to bring wind toys (kites, pinwheels, wind chimes) to worship to be rung before, during or after the service. Encourage everyone to wear red to church on this Sunday. Serve red foods, such as strawberries, cranberry juice, or bread served with raspberry jam. Read Africa Dream, a short story book by Eloise Greenfield, to discover the richness of God's gift of memory and imagination. Prepare to discuss ways in which the lives of our ancestors can affect who we are today. Speak. During worship, have the reading from Acts 2:1-4 read in a variety of languages. Don't forget to tap into students who are learning a new language. Make paper candles: Take a cardboard tube (such as from a paper towel roll) and cut construction paper to fit around it. Write on the paper: The flame of the Spirit. Glue the construction paper around the tube. Cut flame shapes from tissue paper (red, yellow, orange) and paste them to the inside of one end of the cardboard tube. Make wind socks: Obtain white paper lunch bags and decorate them with felt markers or crayons. Use glue or staples to attach a tail or crepe paper streamers (red, orange, yellow) to the bag at the corners. Punch a hole in the other end of the bag and tie a 6-foot length of string or yarn to the bag. Create a dove out of paper or fabric and attach it to a telescoping pole to 'swoop down' during the processional and recessional hymns during worship.